Just a thought , perhaps the cannon was not there to fight but just to fire low charge warning shots to frighten ships to heave too? The port bow chaser puzzled me too when fitting it, I would worry where the crew stood to keep out of the way of the recoil...let alone place the tools, rounds and powered need to work the gun. More progress, the winches etc are just placed on the deck so don't panic I know they are not quite in the right position and I still need to finish rigging the cannons. I am now awaiting more goodies in the post from Chuck so I can start the rigging. I also ordered his serving machine and can't wait to try my hand at it for the first time. Super Picture, My great uncle served on Calypso in WW1 as a signaller, he must have the most nautical name in the whole world and yes this is his real name 'Plimsoll Drake'. After work and Family pressures have eased away I am pushing to get my 'dark Cheerful ' finished. I have changed the deck features colours around but I hope it does not offend any historical accuracies too much I already have Chucks cannons, winches,pump etc which I cant wait to start on in the next few weeks. 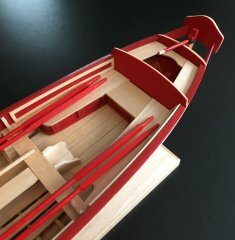 Chuck, are there any plans to produce a 'rope/pulley' kit for this for when I getting around to the rigging? http://www.bbc.co.uk/news/world-asia-39285879 I saw this on the BBC... great to see the methods being used to build these ships.